Youth residents of Mishawum Park – a residential community of 337 apartment homes located on Main Street in Charlestown – recently celebrated the conclusion of the property’s annual Irish Step Dance Program with a holiday performance and special reception with pizza and cookies. 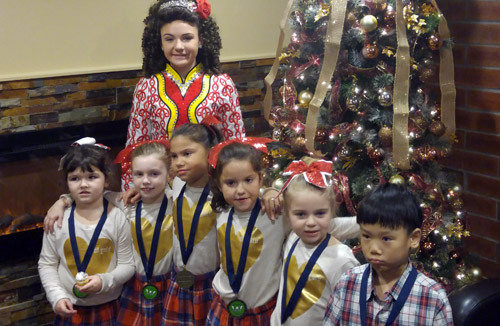 Now in its eighth year, the Irish Step Dance Program was taught by Roseann Woods-McKenna, a Professional Dance Instructor at the Woods School of Irish Dance. The program was funded by a Youth Resident Activities Program grant from MassHousing, which provides educational, employment, and recreational activities to young residents of MassHousing-financed properties. For 15 consecutive weeks, young residents, ages five through seven, learned new step dancing skills and techniques that they showcased in a final performance for friends and family. According to Kelly Tucker, Chair of the Mishawum Park Tenant’s Association, the Irish Step Dance Program is one of the most valued offerings available to youth residents at Mishawum Park. Mishawum Park is managed by full-service real estate firm, Peabody Properties, Inc. and owned by nonprofit entity, Mishawum Park Tenants Association. Pictured above: (back row) Mikayla Newhall. (front row – left to right) Ryleigh Jones, Sara-Lynn Lakeman, Danielle Dejesus, Jessica Dejesus, Olivia Doherty and Derrick Wong.